Pete Funaro started as a busboy at Diamond Lil’s (1528 W. North Temple, Salt Lake City, 801-533-0547) two years after it opened, in 1971, when it was a small cafe that sat 30 people. He became the manager at age 21 and through the years helped expand the restaurant to its current size of almost 20,000 square feet, building the roof and many of the interior walls himself. Funaro bought the restaurant in 2006 after it had been closed for several years and turned it back into a booming business, serving 230 tons of pure steer meat a year. The North Temple construction of the past four years put a damper on things, but Funaro is looking forward to the opening of the new TRAX line that will bring visitors landing at the Salt Lake City Airport to a stop right in front of Diamond Lil’s. 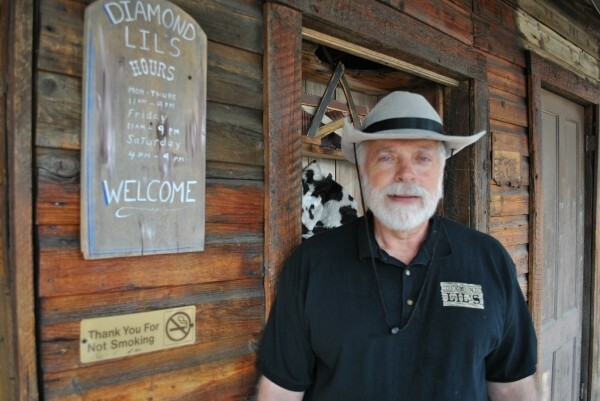 Funaro took City Weekly on a tour of Diamond Lil’s and talked about its history and its future, sharing stories along the way about the many authentic Old West items on the restaurant’s walls. How did you get started at Diamond Lil’s? I came here in early 1971. I came down here from Spokane, Wash. I’d been in restaurants since I was 11. My uncle owned Diamond Lil’s at the time. I said, “You’ve got three guys out here, and I could take all of their places,” because they weren’t moving very efficiently. So one night, they didn’t show up, and he called me and said, “Hey, remember you said you could take these guys’ place? Well, prove it.” So I came down and I started working. In 1973, I became the manager. And I managed it for quite a number of years. What are your thoughts on the North Temple construction project? One of the things that happened over the years was this west side of North Temple had kind of fallen into disrepair, because it had been kind of neglected. A lot of the thrust went downtown into the city development and redevelopment, and consequently this side has been left alone. But with this new TRAX thing coming through, it’s a great opportunity for development. And Stacy & Witbeck Construction, they’re really efficient, and they’re operating ahead of schedule, and they’ve kept us all informed. I think it’s a great thing. It’s going to bring new development. This is going to be the grand boulevard leading into Salt Lake City. How has the construction affected Diamond Lil’s? Lucky for us, Diamond Lil’s has a great reputation. We still do a lot of company parties. We have a murder mystery once a month. We’re trying to set it up so every weekend we’ll have entertainment. There’s no question that when there’s construction barricades and major construction going on, it impacts every business on North Temple. I think our business is down probably about 30 percent in the four years they’ve been working on it. This is the longest-running Salt Lake City road project. But with the TRAX stopping right here, it’s going to do nothing but give us more exposure. And more opportunity to serve the people, which is what I really like to do. Do you plan to change anything for the new TRAX line? When the TRAX opens, we’re thinking about moving the entrance [to face North Temple]. The back entrance was the original entrance. So we might move that, and have a little stagecoach stop at the front. You did a big renovation in 2006 when you purchased Diamond Lil’s. What did that entail? It had been closed for about 3 1/2 years. We had to bring the entire building up to current code. Basically, the rooms themselves were still intact. We built this place a room at a time. When we started, it was only 1,000 square feet. Now it’s a 10,000-square-feet footprint, and close to 20,000 on three floors. It’s a great old building. It really looks like the West. It’s half history and half restaurant. We have some real antique art and some prints that are really interesting. I’ve had people come in occasionally and want to buy. People come in all the time and have things that they want to offer us—old antiques or things that they had on the farm. We’ve also recently opened Diamond Lil’s mobile. It’s kind of like an old log cabin, mobile kitchen, and we take that around and serve people. We do a lot of catering with that. We sell smoked brisket, pulled pork, meatball sandwiches and Italian sausages—which we also make here.